On October 13, 2009, the air conditioner manufacturers and a few energy efficiency advocacy organizations announced that they had come to an agreement on changes in the federal energy efficiency standards for air conditioners and heat pumps. In 2008 a coalition of energy advocates and experts had begun an open process to update the Federal Standards. That group had almost universally agreed that there were two fatal flaws in the current air conditioner test procedure. 1) The fan energy consumption and test conditions were totally unrealistic; resulting in inflated ratings. 2) The test did not distinguish between air conditioners that provided good dehumidification for wet climates and superior cooling for hot dry climates. It was agreed that the test procedure needed to be changed simultaneous with new standards since the revised test procedure would produce different ratings. Sometime after the initial coalition interactions a group of manufacturers and a few energy advocacy organizations met behind closed doors and produced the back room agreement that was announced on October 13, 2009. This agreement does not fill the needs of the citizens of the United States for a valid test procedure and minimum standards to choose air conditioners and heat pumps properly designed for their climate. The table below outlines what the manufacturers won and what the population lost. Items 1 through 5 cover the problems with the test procedure and calculation. Items 6 through 11 cover the minor improvements in efficiency specified over the next 12 years (between 0% and 0.6% per year). Items 12 through 16 cover additional items. 7/9/2014 "Unprecedented Collaboration Helps California Rely on Efficiency"
6/18/2014 "Billing Data Must Be Analyzed With Regression Models... Baffling Readers Into Silent Acceptance"
5/1/2014 "John Proctor and Brad Oberg Inducted into Building Performance Industry Hall of Fame"
4/8/2014 "It’s Time to Refocus California’s Climate Strategy"
12/5/2013 INNOVATION EMBRACED OR SIDELINED? 11/22/2013 Revised building simulation program now available from the California Energy Commission. 10/23/2013 This week’s lab results: BPM/ECM motors save energy in ACs, except when they don’t. 10/16/2013 A new residential building simulation program is being released by the California Energy Commission. 10/9/2013 Research Update! Proctor Engineering is researching the Whole House Concept. The 9th annual North American Passive House Conference happened two weeks ago in the San Francisco Bay Area of California. The Passive House Institute US (PHIUS) has been holding this conference every year since 2006. This year's conference seemed especially good because of the direction PHIUS is taking the passive house movement in North America. The Energy Vanguard Blog talks about the people, topics, ideas and events during this year's conference. 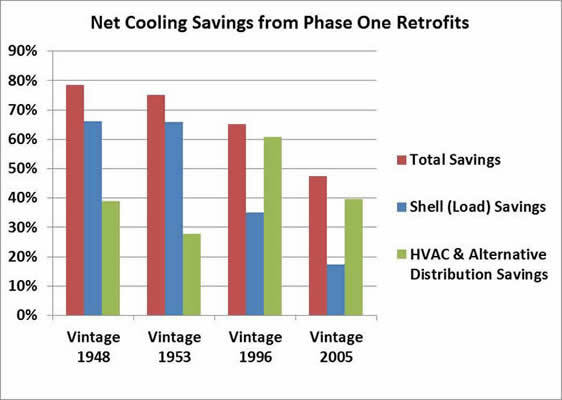 9/10/14 - Achieving 50% to 75% Cooling Savings in Vintage Homes - How? The Central Valley Research Homes Project sponsored by the California Energy Commission achieved measured cooling savings on vintage homes ranging from 48% to 79%. It was achieved without exotic retrofits but through judicious application of known improvements to the building shells and to the cooling systems. Four different vintage homes in Stockton California were fully instrumented and were unoccupied for a three year test of achievable heating and cooling savings on existing homes. Occupants were simulated by heating and humidification internal gains on a fixed schedule. A baseline year established the performance of the homes as found. Retrofits consisted of insulation, air sealing and modifications to the existing HVAC systems. The older homes received new windows. All the homes were then operated for another year to monitor the actual (not modeled) savings. As shown in the graph, the conditions of the building shells in the older two homes provided the greatest opportunity for savings in those homes. In the newer homes, the largest available savings were in the HVAC systems since the shells were thermally in better shape. 7/9/2014 - "Unprecedented Collaboration Helps California Rely on Efficiency"
"The newly formed California Technical Forum has begun working to facilitate bigger and better energy efficiency programs by developing accurate and consistent savings estimates that can be used across the Golden State. This is extremely important because savings estimates provide the foundation for the state’s more than $1 billion annual investment in energy efficiency. Effective programs require that the savings estimates are accurate, reliable, and timely. Last week’s meeting was the culmination of an intensive year of planning and preparation for the launch of this new initiative, which was collaborative from the start. A wide range of stakeholders contributed time, resources, and ideas to getting it off the ground." Read the full posting & view members at the NRDC Website. 6/18/2014 - "Billing Data Must Be Analyzed With Regression Models... Baffling Readers Into Silent Acceptance"
"The use of billing data to estimate energy savings from conservation programs has been transformed by the recent growth in DSM programs and utility cost-recovery mechanisms which depend on "measured" savings. It appears that, in the eyes of many leaders in the DSM field, the relatively simple and obvious approach of comparing pre-treatment and post-treatment usage (with appropriate normalization as needed) for each participating building and a sample of comparable nonparticipants is no longer an acceptable approach, nor even a desirable component, for program evaluation. Instead, billing data must be analyzed with grand multiple regression models that supposedly control for all extraneous factors. A particular coefficient is proclaimed as the true program savings, baffling most readers into silent acceptance. While such models may sometimes prove useful, they are often inappropriate, unstable, and fail to satisfy the assumptions which they rely upon. In the hands of less skilled (or less scrupulous) evaluators, these models can easily give misleading or biased results due to common problems such as model misspecification, outliers, undue influence, multicollinearity, and heteroscedasticity. I believe that evaluations based on coefficients of multiple regression models need to include critiques of the models selected and should provide sufficient information for an informed reader to assess the model for themselves. Additionally, the results of simpler analyses should be provided for comparison. Unfortunately, these principles are rarely followed in current "state-of-the-art" DSM evaluations, leading to results that are inscrutable and therefore questionable." 5/1/2014 - "John Proctor and Brad Oberg Inducted into Building Performance Industry Hall of Fame"
John Proctor and Brad Oberg were inducted into the Building Performance Industry Hall of Fame. Nominated by their peers and selected by a panel of impartial judges, these individuals were recognized for their significant and lasting contributions to the building performance industry over the course of their careers. John Proctor P.E., a nationally recognized expert in energy efficiency, is CEO of Proctor Engineering Group, an energy efficiency and quality assurance consulting firm that specializes in improving the performance of new and existing HVAC equipment. John's experience is in both commercial and residential buildings. He has worked with clients including, but not limited to ARTI, USDOE, EPRI, the California Energy Commission, Pacific Gas and Electric Company, and Florida Power and Light. John is one of the original "House as a System" gurus, and the creator of CheckMe!®, an integrated system that combines human experts and computer expert systems in real time contact with field technicians to achieve proper installation and repair of air conditioners, heat pumps, duct systems, as well as other residential and commercial systems. Read more at the BPI webpage. 4/8/2014 - "It’s Time to Refocus California’s Climate Strategy"
After reading the article discussing California’s climate strategy, Sam Borgeson added a particularly good view point: "My reading of past efficiency program results is that least cost procurement of EE has set incentives that run counter to innovation, undermining potential both here and abroad. Program rules that pay utilities based primarily on short term deemed savings penalize risk taking and leave no room for failure (aka learning). So even in CA, we are unlikely to achieve our goals unless we re-align program incentives to reward creative and innovative solutions, which require risk taking." To read the whole article and discussion visit The Energy at Haas website. ASHRAE Standard 62.2, “Ventilation and Acceptable Indoor Air Quality in Low-Rise Residential Buildings” is under continuous revision. John Proctor was a voting member on this standard setting committee at the time it was formed. During that period, the committee was prevented from saying anything about unvented gas heaters also called “vent-free appliances”. These are outlawed in California, but are sold widely elsewhere. Mr. Proctor is back on the committee at the same time ASHRAE has allowed the committee to address these appliances. The committee is looking for suggestions as to what they should say about them. Severin Borenstein writes about the wood smoke problem in California, people's ability to deny uncomfortable truths about pollution, and the war against climate change in "What wood smoke has taught me about fighting climate change" from the Energy Institute at Haas. 12/5/2013 - INNOVATION EMBRACED OR SIDELINED? Do the processes below lead to implementation of innovative measures and products? See our thoughts below the diagram. This process defines innovation worthy of an IDEEA contract as something that someone else is already doing. It’s actually even more specific than that - it has to be something that someone else is already doing in a CA utility program. This discourages innovation and the sharing of innovative ideas since instead of rewarding the innovators the process invites non-innovators to get contracts implementing and profiting from someone else’s ideas. The process assumes that the ETCC program produces a pathway to implementation in a utility program. That pathway doesn’t seem to actually exist. Especially for residential and small commercial programs where site to site diversity is too great for an ETCC laboratory evaluation or limited field evaluation to produce sufficient data to satisfy ED or IOU staff that savings are reliable. More often ETCC is a lengthy process that leads to a dead end, even if savings were observed. Residential and small commercial pilots of sufficient scale to demonstrate savings for innovative new technologies are needed. The pilots require M&V mechanisms to document the savings in a manner that will stand up to ED and IOU staff scrutiny, which is a substantial cost due to the number of sites involved. Requirements that the IDEEA programs be cost effective with TRC>1 prevents the types of pilots that are needed to produce reliable savings data from being implemented. These innovation programs are being held to the same workpaper requirements as their large scale programs. While it is reasonable to require documentation that savings occur in the laboratory and are probable in field application, it is not reasonable to require that proposed ideas already have ED approved workpapers. It is not reasonable to require workpapers for innovation programs to go through a lengthy review process that delays program implementation and reduces the opportunity for program success within the contract period. The purpose of these programs should be to produce the data to support an ED approved workpaper for a large scale program. 11/22/2013 - Revised building simulation program now available from the California Energy Commission. The CBECC-Res 2013 1c (496) update to version 1C includes several bug fixes and improvements that resolve problems reported by users. This is a critical update for compliance users of version 1c since one of the fixed bugs caused CBECC-Res to occasionally crash or give incorrect compliance results. The California Building Energy Code Compliance Software (CBECC-Res 2013) was written by a team led by Bruce Wilcox, P.E. and Proctor Engineering Group contributed analysis, HVAC modeling, and monitored data to compare the results to actual buildings. For More information in some of the monitoring use the search field above and enter “Monitoring” or Click Here. The latest release of this open source software is available at: www.bwilcox.com/BEES/BEES.html. Over 30 years ago we had a misunderstanding – actually a lot of misunderstandings. At that time it was generally accepted that caulking and weather stripping were the first things you would do to your house to save energy. “Who’s Taking the Heat” showed caulking the outside of the house. Some people knew better (see Twin Rivers Report). Now we know that external caulking often traps water into the structure and causes mold and rot. We also know that the air leaks that need attention are high in the structure, between the attic and the conditioned space and at the base of the bottom floor between the crawlspace and the conditioned space. At that time it was generally accepted that you should duct tape your ducts. Leaky Ducts are a problem, but the way to fix them is not with tape. Now we know that only mastic will hold up on ducts – tape doesn’t. 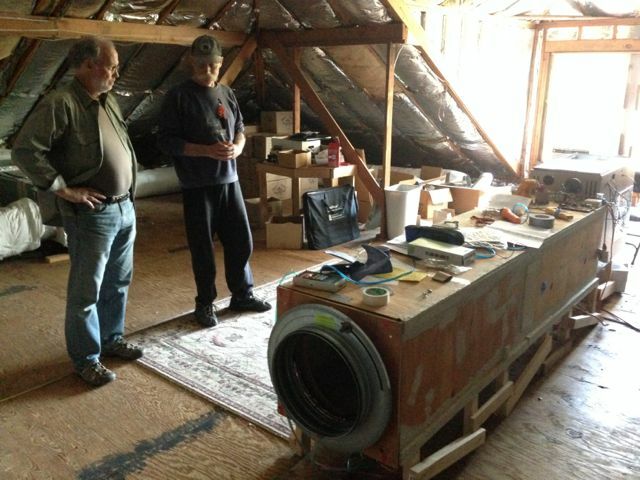 We also know that poorly insulated ducts in the attic are a big problem, but we need R-30 not the R-2 (max.) foil insulation shown in the November 13th ABC Segment and not the common R-4, R-6, or R-8 either (Insulation's R-value is its measurement of resistance to heat transfer). It is time that major media outlets like ABC News get energy efficiency straight. There is no way that caulking and weatherstripping will save $284 of heating in a year. 10/23/2013 - This week’s lab results: BPM/ECM motors save energy in ACs, except when they don’t. BPM/ECM motors have been proven to save energy in air conditioners. The Concept3™ motor for example with it’s hot dry setting saves 24% of the cooling bill. It also saves over 50% of the furnace fan electric energy in heating. It was with excitement that we found that a manufacturer of the recessed “pancake” air conditioners commonly used in apartments was offering a unit with a BPM/ECM. So we got one and tested it against their standard PSC model. The results were disappointing. The BPM saved only 10 Watts of fan energy at the unit’s rating point. The graphs below show the watt draws and airflows in the test laboratory. 10/16/2013 - A new residential building simulation program is being released by the California Energy Commission. A three year research project to discern the effectiveness of various interactive retrofits on existing homes is underway in Stockton, CA. The project team is led by Bruce Wilcox, P.E. and includes Rick Chitwood and Proctor Engineering Group. The project monitored four homes of different vintages (1948, 1953, 1996, and 2006) for the first year as a baseline. Each of the houses was retrofitted with reference heating and cooling systems to operate on alternating time periods with the existing HVAC system. These reference HVAC systems were fully contained within the conditioned space of each home (except the condensing units for the air conditioners). The first year results confirmed that the existing systems with ducts in the attic consumed between 72% and 142% more energy to cool the homes to the same levels. . The graph below shows the daily energy consumption for the newest home plotted against maximum daily outdoor temperature.